Rusty pipes, fixtures and water heaters can lead to rust particles in your water supply. 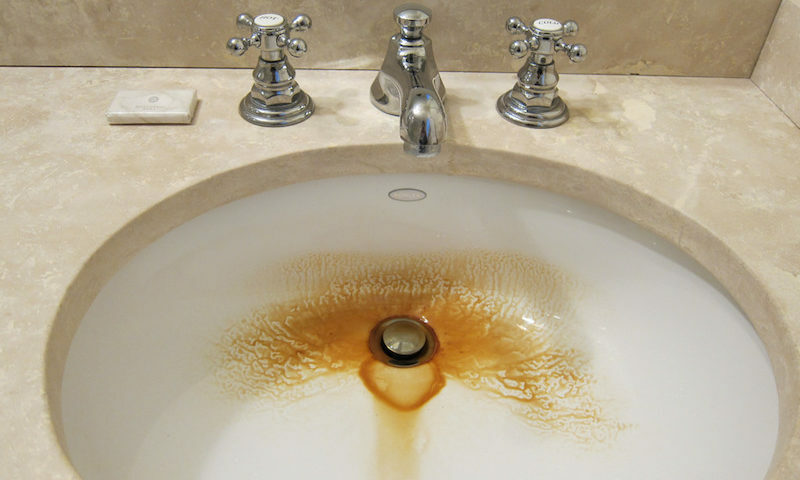 Let’s talk about what you can do about the brown stains this water can leave on your sinks, tubs and toilets over time. Pumice. The airy, crumbly volcanic rock is renowned for its gentle scouring abilities, and there are a few pumice products that are ideal for removing rust stains from porcelain. Try using a pumice stick or scrubber designed for porcelain and tile — much like with a scouring pad, you’ll need to apply some elbow grease, but you’ll save money in the long run with multiple cleanings per product. Chemical cleaners. If those environmentally safe scouring techniques don’t work for you, you can always try a chemical cleaner — but your everyday cleaners won’t cut it. Even bleach is a poor match for tough rust stains. Look for a cleaner that contains hydrochloric acid and is safe for use as a tub and tile cleaner. Follow the safety instructions carefully, as these products are hazardous if mishandled. No sink, toilet or tub is made to last forever, and etched-in rust stains may have you thinking about replacement. The experts at Reasonable Rooter can not only help you install new fixtures, we can help you stop the problem at its source.